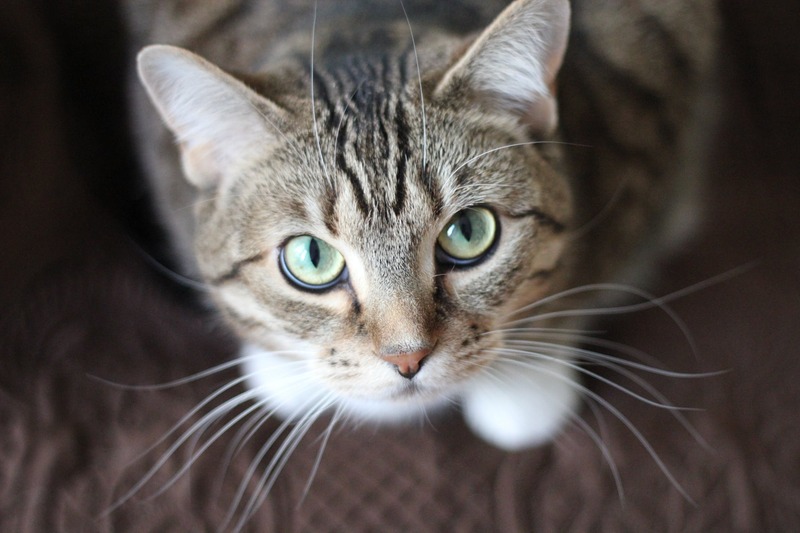 Feline Eye Conditions - Learn What They Are | Animal Eye Associates, P.A. Your pet has been diagnosed with a corneal sequestrum. This occurs most commonly in cats. The Himalayan and Persian are the two most commonly-affected breeds. It appears on the cornea as a black spot, and is actually an area of dead corneal tissue. The symptoms of a sequestrum are a black spot on the eye, excessive tearing and squinting. The cause of sequestrums is unknown, but it may be associated with a feline herpesvirus. The treatment for corneal sequestrum is surgical removal. The procedure is called a lamellar keratectomy in which the sequestrum is surgically “peeled” off the cornea. This is performed using an operating microscope and your pet must be under general anesthesia. Occasionally when the sequestrum is removed, it leaves a very deep ulcer. A conjunctival graft is placed over the deep ulcer to help with healing. This involves an additional specialized procedure. Early removal of the sequestrum gives the best postoperative results. Although uncommon, these sequestrums may recur after surgery. Following surgery, recheck examinations are important to monitor for healing and any signs of recurrence. If you have any questions regarding corneal sequestrums, or the surgical procedure, please feel free to contact our office at 407-629-0044 ext. 1. Keratitis means inflammation of the cornea, and conjunctivitis means inflammation of the conjunctiva. Cats can develop a special type of keratitis and conjunctivitis that is called eosinophilic keratoconjunctivitis. This disease is named after the type of inflammatory cell that is seen in the disease tissue. Signs of eosinophilic keratoconjunctivitis include tearing, squinting, redness and cloudiness. Diagnosis is made based on clinical appearance and looking at cells under the microscope that have been scraped off the eye. The exact cause of eosinophilic keratoconjunctivitis is not known. It is suspected to be related to feline herpesvirus. Your cat can not be cured of a herpesvirus infection, because the herpesvirus hides in nerves and other tissues. For this reason, feline herpesvirus can cause chronic, recurrent eye problems. Determining if a cat definitely has herpesvirus can be difficult, because so many cats without any disease will test positive for herpesvirus. For this reason, the disease is usually diagnosed based on clinical signs and response to treatment. The goal when treating eosinophilic keratoconjunctivitis is to manage the current flare-up and decrease the chance for recurrence. Many cats need life-long treatment with eye drops to keep the disease from coming back. Management of eosinophilic keratoconjunctivitis can be a frustrating experience, but good communication and teamwork between the pet owner and veterinary ophthalmologist usually lead to satisfactory results. Anterior uveitis refers to inflammation inside the front of the eye, and can result in squinting, cloudiness, tearing and redness. If severe or untreated, it can cause cataracts, glaucoma and blindness. There are many causes of anterior uveitis in cats. 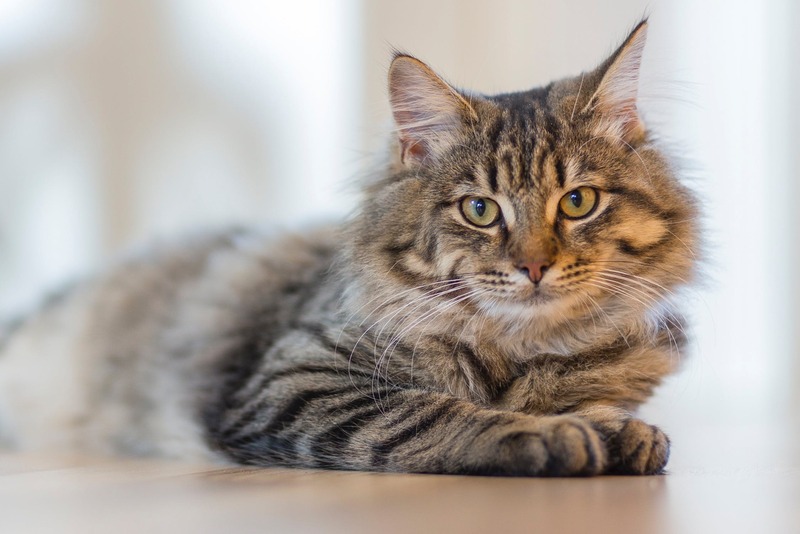 The most common causes include Feline Leukemia Virus (FeLV), Feline Infectious Peritonitis (FIP), Feline Immunodeficiency Virus (FIV), Toxoplasmosis, Cryptococcus and different types of cancer. These are all serious diseases. Toxoplasmosis is caused by protozoa, and Cryptococcus is a type of fungus. It is not difficult to diagnosis anterior uveitis, but it can be difficult to identify the underlying cause. One of the most common causes is idiopathic, which means undetermined cause. Different blood tests, including FeLV/FIV tests and Toxo titers, are usually the first tests conducted once a cat is diagnosed with anterior uveitis. Additional tests may be necessary depending on the results of the blood tests, ophthalmic and physical examination. The anterior uveitis is treated symptomatically until a cause is found. Once the cause if identified, specific treatment can be instituted. Feline anterior uveitis can be a chronic, persistent disease. The outlook for the cat depends on the cause of the anterior uveitis. All of the possible causes, with the exception of idiopathic, have the potential to be life threatening. However, most of the cats with anterior uveitis of undetermined cause respond to appropriate therapy. Specific blood tests for immune diseases, infectious agents or other systemic diseases. The tests include ultrasounds, x-rays, and aspirates, which are samples of fluid or cells. Symptomatic therapy, regardless of the cause is indicated. Topical treatments and medications taken by mouth are designed to reduce pain and inflammation-like treating a headache with aspirin regardless of what is causing the headache. Some patients will require long-term therapy to prevent recurrence of the uveitis. Specific therapy is directed if a cause for the anterior uveitis has been determined. Surgery may be necessary in situations where a tumor or secondary complications (such as glaucoma) are present and cannot be controlled with medications. The type of surgery will depend on the specific problem. It is important that you follow the treatment instructions and learn to medicate your pet properly. It is not always easy to put medications into an animal’s eye, but it is imperative that the medications be given. The follow-up appointments are important to be sure the medication is controlling the disease. Conjunctivitis means inflammation of the conjunctiva, which is the pale pink/white tissue that surrounds the eye. The signs of conjunctivitis include eye redness, discharge and squinting. In cats, conjunctivitis can be caused by bacteria (Chlamydia or Mycoplasma) or a virus (feline herpesvirus). Both adult cats and kittens can develop conjunctivitis. If the conjunctivitis is caused by bacteria, then it will usually get better with antibiotic treatment. However, conjunctivitis caused by herpesvirus can be more difficult to control. Your cat can not be cured of a herpesvirus infection, because the herpesvirus hides in nerves and other tissue. For this reason, feline herpesvirus can cause chronic, recurrent conjunctivitis and other eye problems. Determining if a cat definitely has herpesvirus can be difficult, because so many cats without any disease will test positive for herpesvirus. For this reason, the disease is usually diagnosed based on clinical signs and response to treatment. The goal when treating suspected herpesvirus infections is to manage the current flare-up and decrease the chance for recurrence. 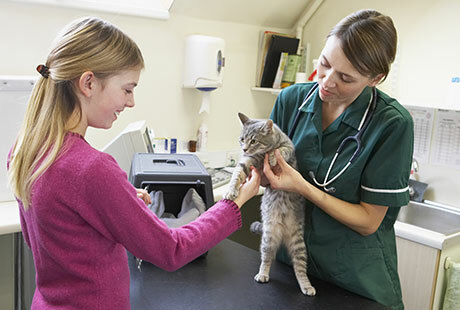 Signs of herpesvirus infection often appear when a cat experiences a stressful situation, like a new family member, a move or a hospital/boarding stay. Management of chronic feline conjunctivitis can be a frustrating experience, but good communication and teamwork between the pet owner and veterinary ophthalmologist usually lead to satisfactory results. Feline herpes virus (FHV) is commonly found in the environment, and most cats are exposed to it at some point in their lives. This initial exposure usually occurs while they are kittens, and can result in an upper respiratory infection, conjunctival and corneal inflammation. 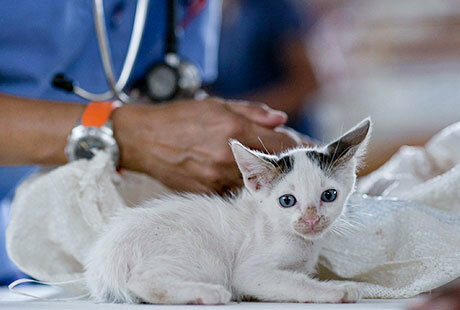 Most kittens with strong immune systems will recover from the herpes virus infection. However, a small percentage of cats may have a prolonged recovery. Also, in some cats the herpes virus retreats to nerve tissue. It is estimated that 80% of exposed cats can harbor the virus in nerve tissue, and 45% of these cats may develop chronic recurrent disease. In times of stress, the virus can reactivate and cause recurrences of eye problems. Feline herpes virus is associated with many ocular diseases in cats, including conjunctivitis, corneal ulcers, eosinophilic keratoconjunctivitis, decreased tear production and corneal sequestra. Clinical signs you might observe include sneezing, nasal discharge, tearing, squinting and swollen eyes. Signs of upper respiratory disease are usually only seen during the initial infection. Cases of chronic, recurrent FHV usually only have eye problems. A diagnosis of FHV conjunctivitis and/or corneal inflammation is usually made based on complete ophthalmic examination and characteristic clinical signs. Definitive diagnosis can be difficult. 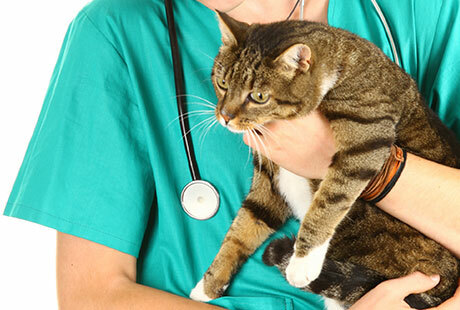 There is a PCR (DNA) test for FHV, but a positive result can be found in both normal and sick cats. Ophthalmic problems caused by FHV can be frustrating to treat, as a FHV infection cannot be cured, only controlled. Treatment will vary depending on what specific problem is present .When FHV is suspected, usually anti-viral eye drops or pills are used. Antibiotic eye drops may be used to address any secondary bacterial infection. Oral supplementation of the amino acid L-Lysine may help minimize recurrences and decrease the severity of future FHV outbreaks. Follicular conjunctivitis is an inflammation of the conjunctiva of the eye(s) associated with increased formation of lymphoid follicles. It is commonly reported in cats and may be associated with viral or bacterial infection. Additionally, chronic antigenic stimulation (i.e. allergies) could also be related to the condition. What signs may I notice in my cat? You may notice a red appearance in the eye(s) with bump on the surface of the conjunctiva, increased tearing and discharge, or rubbing at the eye(s). Treatment may include use of an antiviral, antibiotic and/or anti-inflammatory to help reduce clinical signs. Recurrence is possible following treatment. If you’re in need of a veterinary ophthalmologist in Maitland or Orlando, Florida, contact the professionals at Animal Eye Associates, P.A. today. Our animal eye care specialists are well versed in the various feline eye conditions, and we’ll do everything we can to ensure your pet’s visit is comfortable and stress-free. With more than 50 years of combined experience in veterinary ophthalmology, we’ve been committed to maintaining eye health and restoring vision to Central Florida’s pets since 1992. We specialize in eye exams, surgery, and diagnostic testing. If you have any questions about our animal eye services or you’re ready to make an appointment, contact our friendly staff today.